Federal agents have arrested 243 people — including 46 doctors, nurses and other medical professionals — who are accused of running up more than $700 million in false Medicare billings. Charges range from fraud and money-laundering to aggravated identity theft and kickbacks. The arrests took place over three days in 17 cities. The FBI says more than 44 of the defendants defrauded Medicare’s Part D prescription drug program. Others are charged with running schemes based on overstating treatment times — and in one case, the defendants are accused of billing Medicare millions of dollars for equipment that was either not needed or requested. 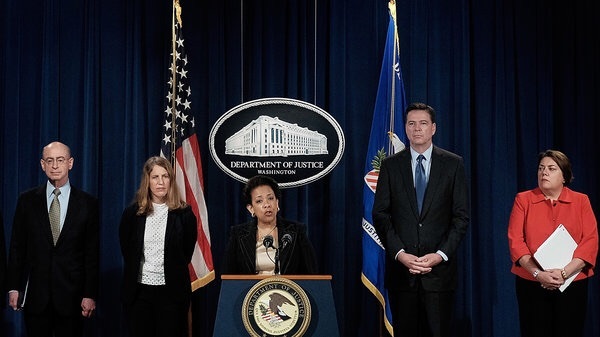 More than 900 law enforcement officials were involved in the arrests, which the Justice Department says are the latest in a crackdown on Medicare fraud. Since it was formed in 2007, the Medicare Fraud Strike Force has “charged over 2,300 defendants who collectively have falsely billed the Medicare program for over $7 billion,” the government says. It adds that in that same span, the strike force has prosecuted more than 200 doctors and more than 400 medical professionals. Last summer, our colleagues at the Shots blog reported on a separate prescription drug scheme that unraveled after a doctor’s Part D billing soared to nearly $5 million. In that case, two secretaries at the doctor’s clinic were found to have faked prescriptions. Miami: Seventy-three defendants were charged with offenses relating to their participation in various fraud schemes involving approximately $263 million in false billings for home health care, mental health services and pharmacy fraud. In one case, administrators in a mental health center billed close to $64 million between 2006 and 2012 for purported intensive mental health treatment to beneficiaries and allegedly paid kickbacks to patient recruiters and assisted living facility owners throughout the Southern District of Florida. Medicare paid approximately half of the claimed amount. Houston and McAllen, Texas: Twenty-two individuals were charged in cases involving over $38 million in alleged fraud. One of these defendants allegedly coached beneficiaries on what to tell doctors to make them appear eligible for Medicare services and treatments and then received payment for those who qualified. The company that paid the defendant for patients submitted close to $16 million in claims to Medicare, over $4 million of which was paid. Dallas: Seven people were charged in connection with home health care schemes. In one scheme, six owners and operators of a physician house call company submitted nearly $43 million in billings under the name of a single doctor, regardless of who actually provided the service. The company also significantly exaggerated the length of physician visits, oftentimes billing for 90 minutes or more for an appointment that lasted only 15 or 20 minutes. Los Angeles: Eight defendants were charged for their roles in schemes to defraud Medicare of approximately $66 million. In one case, a doctor is charged with causing almost $23 million in losses to Medicare through his own fraudulent billing and referrals for DME, including more than 1,000 expensive power wheelchairs and home health services that were not medically necessary and often not provided. Detroit: Sixteen defendants face charges for their alleged roles in fraud, kickback and money-laundering schemes involving approximately $122 million in false claims for services that were medically unnecessary or never rendered, including home health care, physician visits, and psychotherapy, as well as pharmaceuticals that were billed but not dispensed. Among these are three owners of a hospice service who allegedly paid kickbacks for referrals made by two doctors who defrauded Medicare Part D by issuing medically unnecessary prescriptions. Tampa, Fla.: Five individuals were charged with participating in a variety of schemes, ranging from fraudulent physical therapy billings to a scheme involving millions in physician services and tests that never occurred. In one case, a licensed pain management physician sought reimbursement for nerve conduction studies and other services that he allegedly never performed. Medicare paid the defendant over $1 million for these purported services. Brooklyn, N.Y.: Nine individuals were charged in two separate criminal schemes involving physical and occupational therapy. In one case, three individuals face charges for their roles in a previously charged $50 million physical therapy scheme. In the second case, six defendants were charged for their roles in an $8 million physical and occupational therapy scheme. New Orleans: Eleven people were charged in connection with $110 million in home health care and psychotherapy schemes. In one case, four individuals who operated two companies — one in Louisiana and one in California — that mass-marketed talking glucose monitors, or TGMs, across the country allegedly sent TGMs to Medicare beneficiaries regardless of whether they were needed or requested. The companies billed Medicare approximately $38 million for the devices and Medicare paid the companies over $22 million.